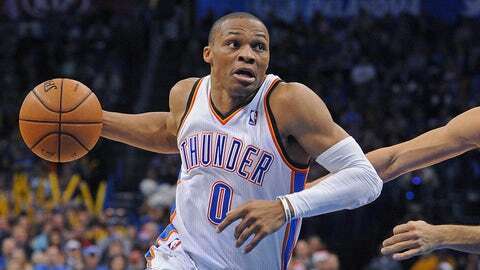 Thunder guard Russell Westbrook has now had surgery on his right knee three times in the past eight months. OKLAHOMA CITY — Russell Westbrook spoke to the media for the first time since having knee surgery eight days ago and said he’s feeling fine and his spirits are good. The team said Westbrook will be out until at least the All-Star game. "I mean, it’s tough," Westbrook said. "You just have to try to find a way to keep a rhythm. Stay intact with the team. Find a way to keep your spirits up and be ready to play next time." Westbrook has now had surgery on his right knee three times in the past eight months, originally injuring it during the playoffs last season. He missed the first two games of this year before returning. Westbrook’s last game was against the Knicks on Christmas. Westbrook wouldn’t say when he would be ready to come back, but coach Scott Brooks said Westbrook was shooting free throws at practice. Westbrook isn’t walking with a crutch and was with the team Sunday before the game against the Celtics in Oklahoma City. "I don’t pay attention to those projections," Westbrook said. "I just wake up and try to get better each and every day." Westbrook said he wasn’t in any pain at any point this season but said the swelling in his knee was becoming an issue. "I’m jut trying to do what’s best for my body and what’s best for me in the future," he said.